What else can be said about Gardnar Mulloy other than he was the greatest tennis player in University of Miami history. There has never been a greater tennis player to don the UM colors. 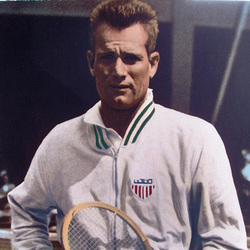 Gardnar Mulloy played on 7 U.S. Davis Cup teams, won 84 National Championships( the men's record at the time), won 16 International Championships, ranked in U.S. rankings top 10, 14 years and #1 IN 1954, won Wimbledon Doubles and is a member of 7 Sports Halls of Fame. Gardnar Mulloy was the best of the best Hurricane netters. He played at Miami from 1934-1936. Mulloy was inducted into the UM Sports Hall of Fame in its inaugural class in 1967. Several of his trophies and tennis racquets are on display. Today’s tennis players and the majority of fans may be too young to remember Gardnar Mulloy, but his resume is unparalleled. His life experiences — including memorable conversations with Queen Elizabeth II and President Bill Clinton — were rich enough that he published two memoirs. He competed for 75 years, won senior titles until his late 80s, and continued shuffling around local courts well into his 90s. During his illustrious career, Mulloy won five Grand Slam doubles titles, including a Wimbledon crown at age 43. He reached No. 1 in the world rankings, won 129 national titles and was enshrined in nine Halls of Fame, including the International Tennis Hall of Fame, which in 1996 started the Gardnar Mulloy Cup for players 80-and-over. Mulloy rubbed elbows with presidents, royalty, movie stars and the world’s best-known tennis players. He also was a lawyer, the University of Miami tennis coach, an author, and he served in the U.S. Navy in World War II, seeing action in Italy and North Africa. He was a lieutenant and a commanding officer of a landing ship tank: the U.S.S. LST 32, leading a crew of 13 officers and 154 men. Mulloy, a graduate of Miami High and UM, grew up near the Miami River, on Northwest Ninth Avenue in historic Spring Garden, where in 1915 his father built a house, and in 1923 added a tennis court. It was one of the city’s first courts. He told stories of Seminole Indians canoeing up the Miami River and setting up camp in his neighborhood. He used to sneak over to the bootleggers’ headquarters down the street and earn a buck a day for helping repair their speedboats. In 2013, a section of Northwest North River Drive was renamed Gardnar Mulloy Way. He remained in the neighborhood his entire life, in a modest three-bedroom home next door to the one he grew up in. The house could pass for a tennis museum. Hundreds of trophies, plaques, old photographs and film reels clutter the living room. The remains of the original family court could be seen in the backyard. After the street naming ceremony, Mulloy reminisced about his childhood — catching crabs, drinking fresh milk from a neighborhood cow and climbing a huge oak tree with Marjory Stoneman Douglas. When he was 10, he stayed overnight in the tree because the county was threatening to chop it down. Mulloy became a legend in the area’s tennis leagues and played No. 1 at Miami High. They knew him at Flamingo Park, the Surf Club, Coral Gables Country Club and Moore Park. Henderson Park was his home court. Mulloy went on to establish the University of Miami’s first tennis team while he was on a football scholarship in 1935. He also boxed for the university. His first year as Hurricanes tennis coach, the team took road trips around Florida and to Havana. The next year, the players piled into two cars and headed north to play Yale, Harvard, Columbia, Princeton, and Cornell. “We clobbered everybody,’’ said Mulloy, who also wrote and transmitted game stories to The Miami Herald via Western Union. Among his UM recruits was Ecuadorean great Pancho Segura, who went on to win NCAA titles in 1943, 1944 and 1945. In 1939, Mulloy won his first national title at a father-son event. He teamed with Bill Talbert to win the U.S. Open doubles titles in 1942, 1945, 1946, and 1948. In 1957, at age 43, Mulloy won the Wimbledon doubles title with Budge Patty. He also reached the singles final at the U.S. Open in 1952 and the doubles final at the French Open in 1951 and 1952. Mulloy was a member of seven Davis Cup teams. The Wimbledon trophy, a small silver bowl, was his most prized possession. He recalled being sneered at by a group of white men on a boat to Havana after he chatted with a black man on board. The man was Jesse Owens, who was headed to the same sports festival as Mulloy. Or the time in the late 1960s when he and Arthur Ashe showed up at a tournament in Jacksonville and Mulloy was offered a swank cottage while Ashe was told he would have to stay in a motel on the south side of town. He told the New York Times in 2005 that “the most impressive incident’’ of his life was on Center Court at Wimbledon in 1957 as Mulloy was receiving the cup for the men’s doubles title from Queen Elizabeth II. Years earlier, at a pre-Wimbledon garden party, Mulloy was seated next to Elizabeth, who was then the crown princess. Mulloy asked her why she had not been sitting in Wimbledon’s royal box. In 1957, when Queen Elizabeth presented the doubles trophies to Mulloy and Patty, Mulloy asked if she remembered him. Mulloy also recalled meeting President Clinton in the mid-1990s at a senior event in Washington, D.C. When he walked up to Clinton to introduce himself, the President said he knew exactly who Mulloy was, that he had followed his career when he was a child. Mulloy regularly attended the annual tournament on Key Biscayne. Among today’s players, he liked Roger Federer. He told the New York Times in a 2010 interview: “[Federer’s] not only a great player, but he doesn’t overact after he wins. Mulloy said his secret to longevity was his healthy lifestyle. In addition to a lifetime of athletics, he was a vegetarian. He avoided sugar, soda, coffee, tea and alcohol. He got tipsy just once in his life, during college, he said. He was also an animal lover. In his later years he had five rescue dogs and four rescue cats around his house. In 1982 he mortgaged his home to start Pet Resuce, Inc. on a four-acre lot in Miami Gardens. Mulloy was married for 55 years to Madeline Cheney Mulloy, who was a college homecoming queen and died in 1993. He first met his current wife, Jackie, in 1957 at Wimbledon. She went on to marry an Irish actor and a British philanthropist, Sir Robert Mayer. After Mayer’s death in 1985, she reconnected with Mulloy at a tennis event in Monaco and then turned up for his 90th birthday party. They married in 2008, when Mulloy was 95.